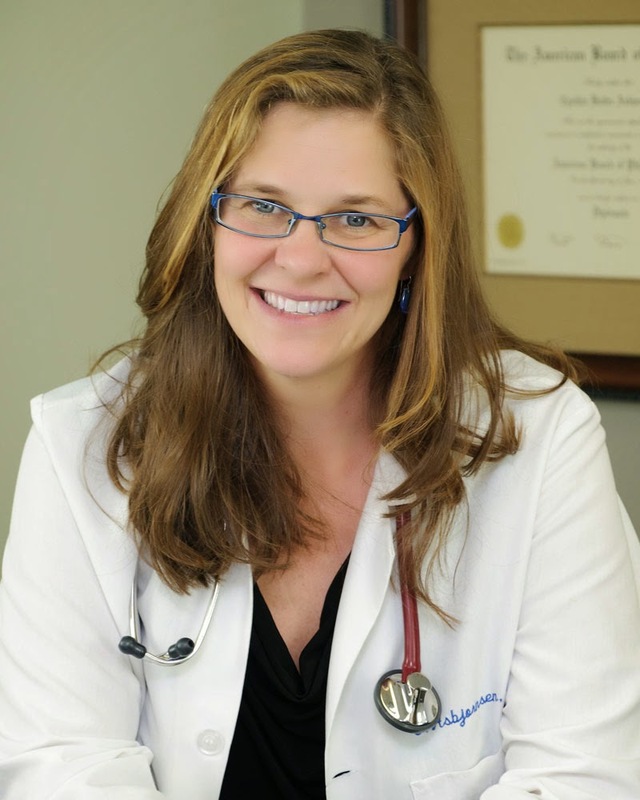 Dr. Cindy Asbjornsen, Founder of the Vein Healthcare Center, truly loves to educate people -- patients and doctors, alike -- about vein health. 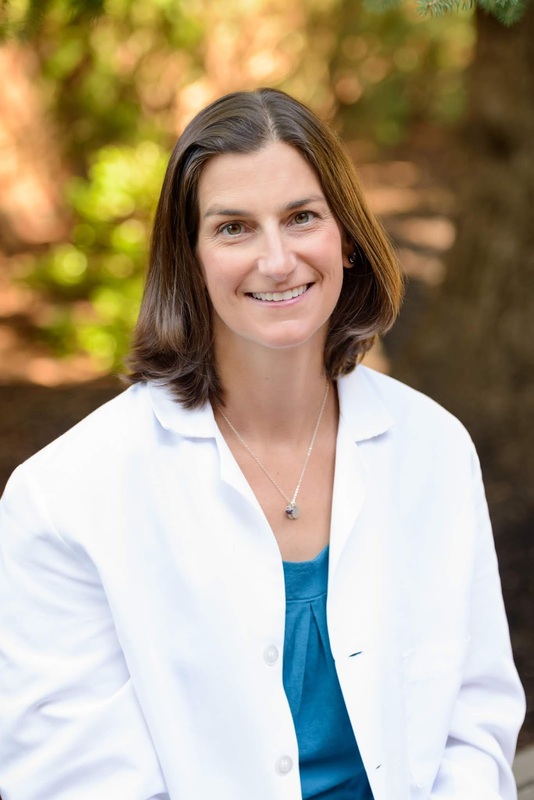 Dr. Asbjornsen recently gave a community seminar at Coastal Pharmacy & Wellness in Portland, Maine, where she discussed the basics of how veins work...and what to do when they don't. And, she explained what phlebology is! Participants asked tons of great questions, including what do do about the so-called "Economy Class Syndrome" and DVT. Dr. Asbjornsen explained that you don't need to be in economy class (or even on an airplane) to be at risk for bad circulation. It's really about sitting in the same position for too long. A long car ride, for example, can have the same effect. Dr. Cindy's simple and practical advice for keeping your veins healthy during a lengthy car ride is three-fold. One, do the calf pump frequently (also known as "the foot pump"). Two, stay hydrated. Three, stop for restroom breaks! That will get your calf muscles moving AND give you a reason to keep drinking water during the ride. Click here to watch the vein seminar. Click here to contact schedule an appointment, or to ask us any questions. We look forward to hearing from you! In our last post we introduced you to Manny and Brad, our Technical Director and Vascular Ultrasound Technician, respectively. We'd like to introduce you to some people you are also likely to encounter as a patient of the Vein Healthcare Center. Throughout your time at VHC, our receptionist Mallory Parlin may be the first person You'll talk to-- and the last! She schedules new patients and assists them with paperwork, as well as answers questions about insurance or compression. 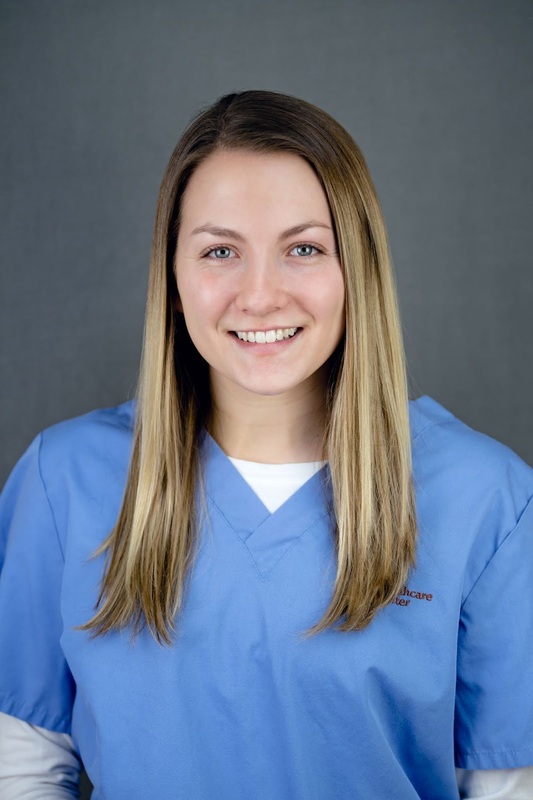 Mallory's goal is to make sure that patients leave her desk without any worries. Our medical assistants are Meghan Lanci and Hayley Quirion. Both Meghan and Hayley prepare patients for their appointments, assist with procedures, and provide administrative support. And both strive to make patients feel comfortable and welcome. 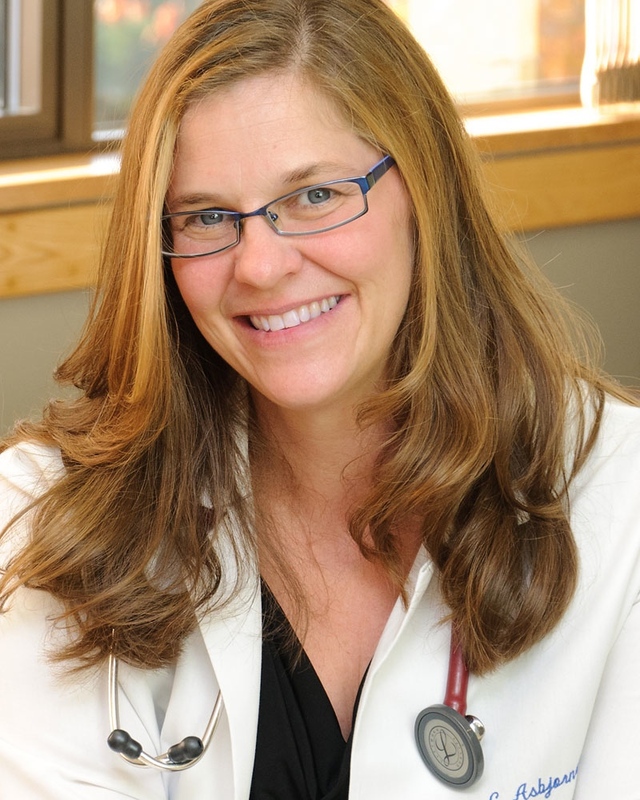 The Vein Healthcare Center runs smoothly, thanks in large part to Sarah Tremblay, VHC's Office Manager. Her role is to plan the schedule, handle insurance authorizations, and answer any questions patients may have about their coverage. 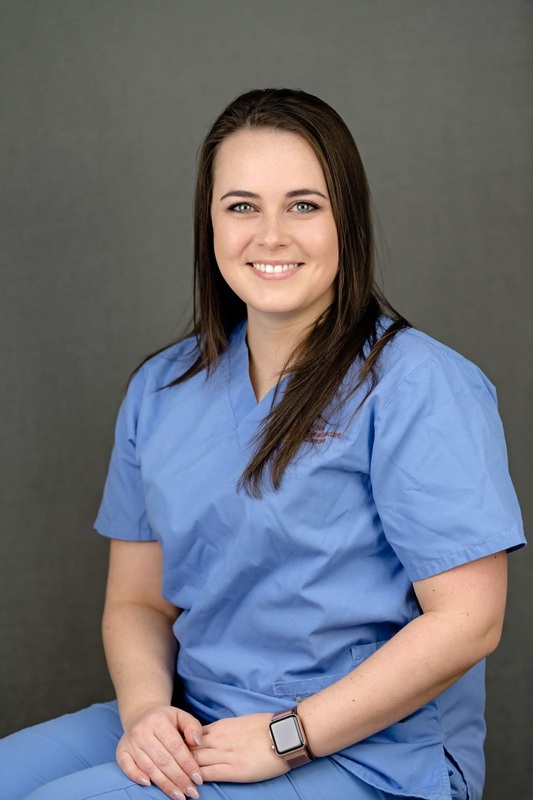 Before becoming Office Manager a year ago, Sarah was Dr. Asbjornsen's medical assistant for four years. She says that after working at VHC for more than five years now, she's seen many patients improve their overall health. If you'd like to learn more about your venous health, click here. And if you'd like to learn more about our staff, click here. We're looking forward to working with you toward better health! Meet the Vein Healthcare Center team! Dr. Cindy Asbjornsen, the founder and fearless leader of the Vein Healthcare Center, relies on the entire staff at VHC to ensure that our patients feel safe, comfortable, and cared for. 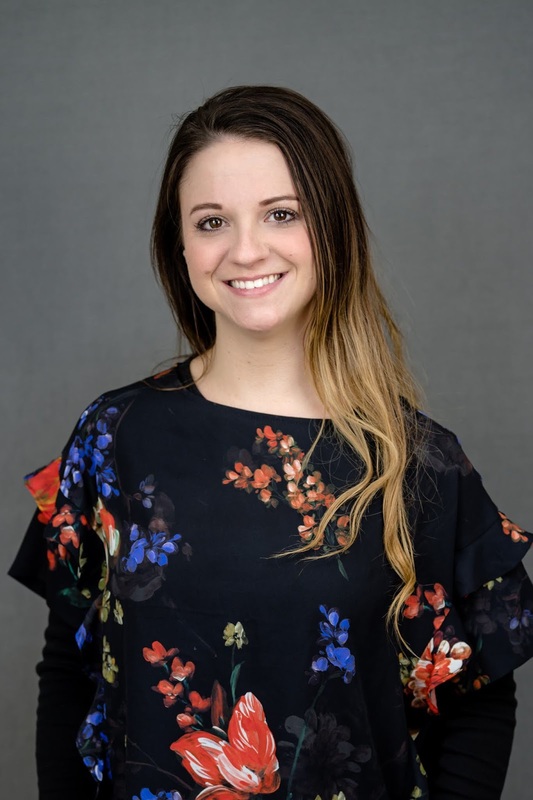 You may remember our interview with Physician Assistant Alison Scheib, but we thought you'd be interested to see who else makes up our team! Our ultrasound departMent is second to none. Emanuel "Manny" Papadakis is our Technical Director and a registered diagnostic cardiac sonographer (RDCS) and registered vascular technologist (RVT). 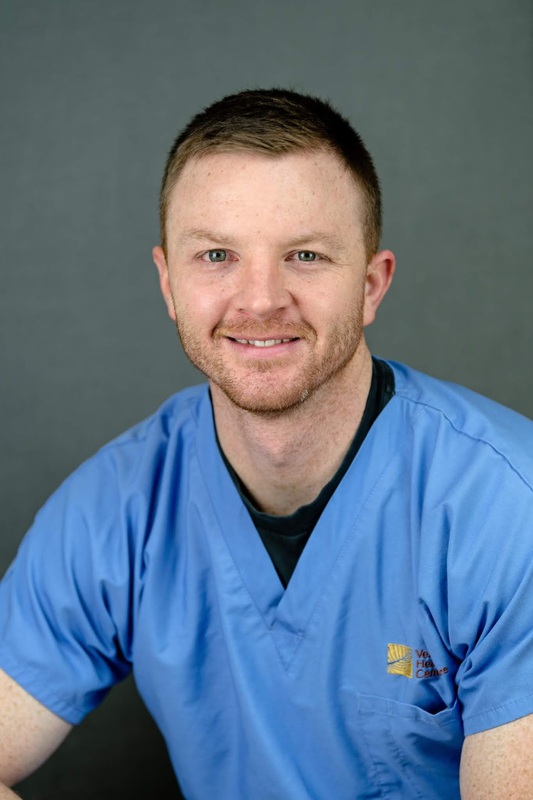 Brad Thomas, RVT, RDMS, is our Vascular Ultrasound Technician. 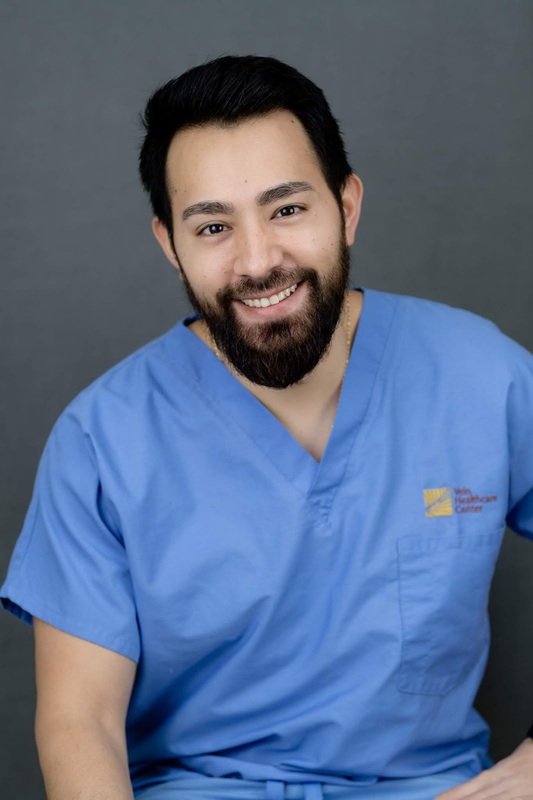 Both Manny and Brad work with patients in two ways: they produce vein mappings that help the physician create a treatment plan, and they provide ultrasound guidance for ablations and sclerotherapy treatments. Both sonographers also care for patients in other ways. Brad does his best to make patients as comfortable as possible, treating each person as though they are a member of his own family. 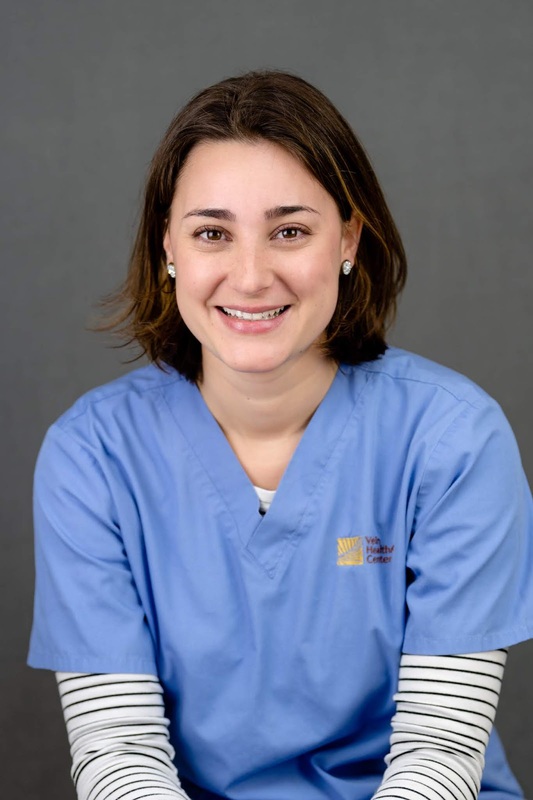 Similarly, Manny tries to connect with patients and get to know them a bit more on a personal level, making for a more comfortable and less intimidating visit. In our next post, we'll meet a few more people who make up the VHC family! 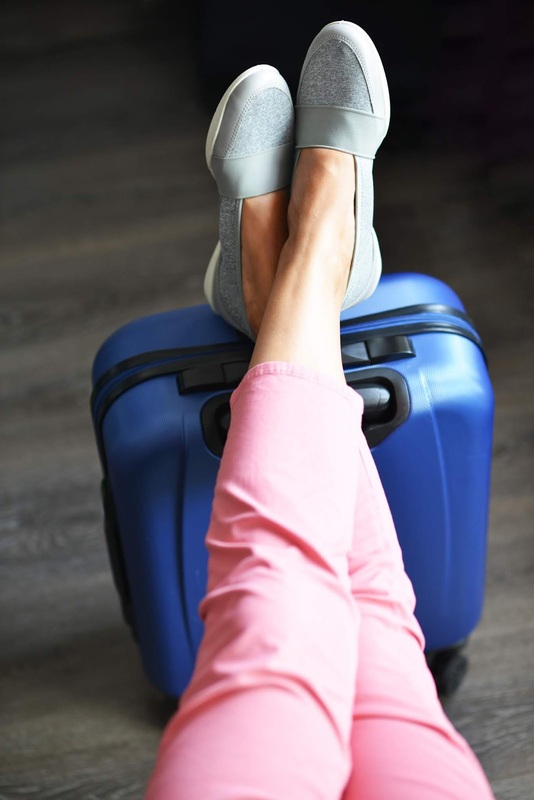 If you'd like to find out more about treatments for varicose veins, spider veins, or other venous issues, please contact us at the Vein Healthcare Center. There are a lot of myths about venous (vein) disease, and how to treat it. Rather than add to the confusion by repeating them here, we're happy to present these 15 facts to consider. 1. Vein problems are among the most common chronic conditions in North America. 2. Approximately half of the U.S. population has venous disease. 3. In this country, 50 to 55 percent of women and 40 to 45 percent of men have venous disease— of these, 20 to 25 percent of the women and 10 to 15 percent of men will have visible varicose veins. 4. Varicose veins affect one out of two people age 50 and older, and 15 to 25 percent of all adults. 5. Every year an estimated 4.6 million U.S. work days are lost due to venous disease. 6. Gender and age are two primary risk factors in the development of venous insufficiency. 7. Individuals who have been pregnant more than once, have a family history, or spend a great deal of time standing increase their risk of the disease. 8. If varicose veins are not treated, they will not go away on their own; in fact, they usually get worse over time. 9. Without treatment, early symptoms of venous disease can lead to lipodermosclerosis, a disease of the skin and connective tissue; an increased chance of superficial venous thrombophlebitis, clotting in the superficial veins that causes severe pain; or ulceration, wounds on the leg that will not heal. 10. Venous disease can be a factor in chronic leg cramping or restless leg syndrome. 11. Symptoms and progression can usually be controlled with compression. 12. Some people with venous disease present with no symptoms. 13. Treatment can stop the progression of the disease; it can restore health and quality of life for those with early stage symptoms and for those struggling with late-stage symptoms. 14. For most people, even debilitating symptoms are treatable. 15. It’s critical that an evaluation involve close attention to the entire venous system, so that poorly functioning veins can be treated at the source. Education is an important first step toward better health – and that includes your vein health! To learn more about the prevention and treatment of venous disease, visit a phlebologist (vein specialist) certified by the American Board of Phlebology (ABPh). While many practitioners may practice vein care, a board certified phlebologist meets the ABPh’s high standard and has the knowledge, skills, and experience to provide quality patient care related to the treatment of all aspects of venous disease. If you'd like to schedule an evaluation of your vein health, contact us at Vein Healthcare Center. We're happy to answer your questions! What is Pelvic Venous Congestion Syndrome? Veins have one-way valves that help keep blood flowing toward the heart. If the valves are weak or damaged, blood can flow in the wrong direction in the veins in the legs and feet, often causing them to swell. 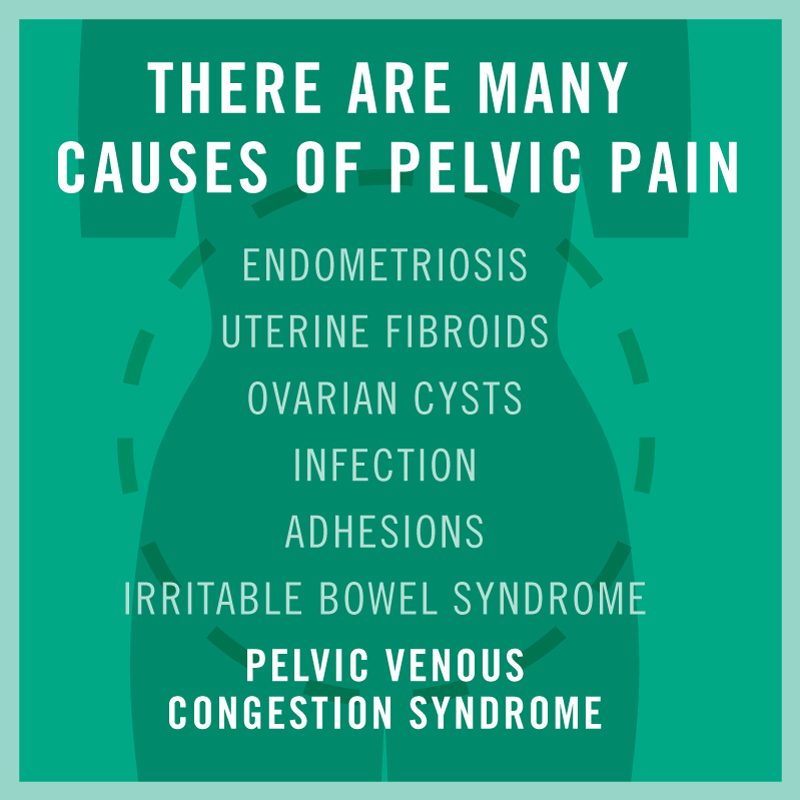 When this happens near the pelvis, it is called pelvic venous congestion syndrome. Simply put, varicose can also develop internally, in the pelvis, uterus and ovaries. Those internal varicose veins can cause symptoms similar to those in the legs. Patients will often have visible varicose veins on their upper legs or labia, but not always. The main symptom is pelvic pain that lasts for six months or more. Patients with PVCS report a prolonged deep and dull ache, often associated with movement, posture, and activities that increase abdominal pressure. Like varicose veins in the leg, the achiness that increases with prolonged standing can often be relieved by lying flat or elevating the legs. Chronic pelvic pain (CPP) occurs below the belly button in the pelvis. The pain may be unilateral or bilateral – meaning on one side of the pelvis or both – and is often more pronounced on one side than the other. The pain is chronic and appears to have no obvious source. Symptoms may also include rectal discomfort or increased urinary frequency, bloating or gastrointestinal (GI) symptoms. According to some studies, more than 26% of women suffer from CPP, but data about its prevalence is incomplete. When taking into account the number of factors that could also cause chronic pelvic pain, one can see how misdiagnosis by medical professionals might occur. Conditions range from problems in the gastrointestinal tract to gynecologic diseases and urologic abnormalities. 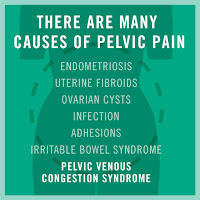 While some of these conditions are easily diagnosed, other causes of chronic pelvic pain are extremely difficult to recognize and have often been underdiagnosed or overlooked– even though studies show that PVCS occurs in up to 30 percent of patients who have chronic pelvic pain. Pelvic venous congestion syndrome, or PVCS, although easy to describe can be challenging to diagnose. In fact, PVCS is often misdiagnosed or never diagnosed at all. To learn more about PVCS and how it is diagnosed and treated, read the latest issue of Vein Health News. If you think your pelvic pain may be related to your venous health, feel free to contact us at the Vein Healthcare Center.